When Mark Andrews, Andy Kelly, and Tim Stillman announced this book I have to confess I couldn’t wait to read it. I have been familiar with Mark and Andy’s forensic analysis of the early days of the club and once more they highlight that fake news is not such a modern phenomenon. What renders their investigations so important is the fact that the Arsenal Football club have next to no records of the founding of the club and subsequent history books have had to lean on the often shaky memories of those involved many years after the event. This book therefore pulls together not only work that the authors have already shared through a variety of means but also includes further evidence of important events in the early years of what has become the giant club of today. I will not share the detail here and deny them the opportunity of every last sale they deserve. Suffice it to say the book takes us on a journey in the late nineteenth century from the founding of a football club by the members of the Dial Square cricket club, to the antagonistic change of home in 1893 and surrounding skullduggery which contributed to the change of name to Woolwich Arsenal Football Club. There is, necessarily, a chronological timetable of events for Royal Arsenal Football Club, but the book then excellently veers into discussion of the crowd, the grounds, the players, and the executives including the likely founders, during this period. Needless to say there were some scoundrels on and off the pitch! The reporting of the change of grounds and the attempts to destabilise the club at this time is fascinating. Similarly the process of the club turning professional is thoroughly covered. Even now the fact that so much had been discovered by the authors about a relatively short timeframe, under seven years, is astounding. However, but for Royal Arsenal turning professional we might all be supporting a different club today. If, like I, you are fascinated by the origins of the club and have a number of the key histories of the club which this tome ‘corrects’ then you simply have to buy it. Many of you have seen some of my historical work and will be aware that by and large I have avoided these earliest days purely because of the work of Mark, Andy, and others in digging deeply into our past. I will make no apology, but will acknowledge borrowing from their research in the future! 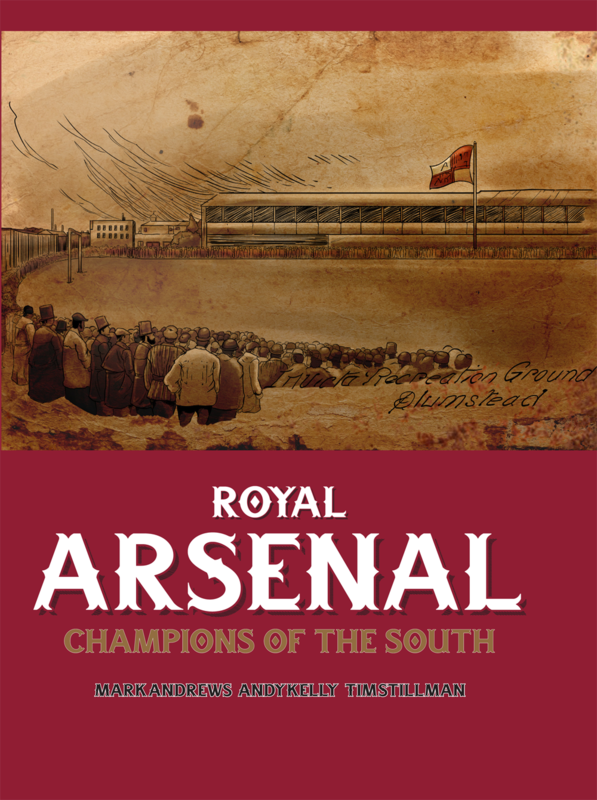 Royal Arsenal – Champions of the South is available from Legends Publishing here. It is required reading for all lovers of the club. Looks great though, I must say. I’m still reading Ray Parlour’s book (a bit slow as real life got in the way recently) and it is such a good read. He clearly adores Arsene Wenger, despite any criticisms he may have made of the team in recent years. I had the good fortune to meet Ray a couple of months ago here. He really is a Gooner first and last Cynic. Top man. Thanks for the wonderful review, Dave. We hope you (and anyone else who has bought the book) enjoy reading it as much as we enjoyed researching and writing it. I hope you read it to the very end. The quote from George Stead at the end of the book is superb. Andy Kelly and Mark Andrews do God’s work. Looking forward to reading their latest work. Looks like a must read. Thanks for the review! Lovely to see Santi back playing football again. After nearly 2 years in the wilderness,he came on as a sub for his old Club Villareal in a friendly on Tues night. I really do hope he gets a few more days in the sun before his career ends as he is still good enough to do a job for them. Fingers crossed his achilles holds up. A wonderful footballer much missed by the club and the supporters during his frustrating and painful injury period. Thanks for the review H. Another very interesting sounding book to add to my must read list. On the other hand, sad news about the Ox. Familiar pattern sadly. @Goonersince54 totally felt the same, such a wonderful sight to see the magician play again. He was sorely missed and i always felt that if he was there in that Leicester winning the league season, we would have won instead. It is just not about winning, it was seeing him play with a smile on his face, never once did i see him sad or unhappy, an odd grimace or shrug apart. Back to the Emery era and conflicting signs about who stays and who is sold. Latest rumour around Kingsley Colman and Andre Gomes suggest we could still lose Ramsey( Xhaka just signed dint he) and maybe the duo of Welbeck and Perez as well. I dont see Colman happening for the price Bayern want, Gomes looks likely if Ramsey leaves for Barca are apparently ok to take the payment in instalments. A CB still beckons for i am just not convinced about Mustafi and i dont see Kos playing again anytime soon. Mesut Ozil wins a place in the L’Equipe worst XI of the world cup. The Unai Emery era will not really begin until the former finds a different employer. thanks for the review, ‘holic. another for the birthday wish list. on a really, really positive note, i’m in london on october 20, and am trying to wrangle tickets for the leicester city game (unless it’s moved to the 21st, the day we fly home; fingers crossed it stays on saturday). ‘holic, if we both end up going, it would be my pleasure to buy you a beer (at least!) before the game. Ritzing. Wasn’t Julie Andrews in a hat? Independent suggests Akpom turning last season’s loan to Sint-Truidense W in Belgium into a £2 million permanent move. Never managed to make the breakthrough at Arsenal. Just 12 first team games in six seasons and never scored a goal despite hitting 33 in 50 games for the U23s. No guns? You must have butter to spread then, too. what can I say ????? No guns is a good thing, cba. Meanwhile in football, Osei-Tutu is in the tour party for Singapore, so I assume that means thank you and good luck to Jenks. Also no Reine-Adelaide or Joel Campbell. A loan for the former and the exit for the latter, I would suppose. Lucas Perez travels with Danny Welbeck still on post-World Cup holiday. And Iwobi gets his picture on the flyer.